Description: Stereophile 2014 Record 2 Die 4! Mastered by George Marino at Sterling Sound from the original analog master tapes! 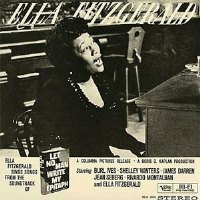 Considered one of Ella Fitzgerald's greatest recordings, she's backed on this 1960 release by pianist Paul Smith alone. Let No Man Write My Epitaph was a 1960 Hollywood movie featuring Fitzgerald. In this very intimate setting, the album hits at a depth of emotional understanding that critics often complained was missing in Ella's reading of jazz lyrics, and once again establishes her as one of the supreme interpreters of the Great American Songbook. This album is one of those rare recordings that are often overlooked because of its relative obscurity. Of the thirteen songs recorded and presented here, only three were actually used in the film. Ella performs tracks like "Misty," "Angel Eyes," "Black Coffee" and a host of others with breathtaking finesse. Paul Smith's sensitive accompaniment is superb. If you had to have one Ella Fitzgerald record, as everyone should, this would surely be a worthy candidate. Originally released in 1960. This hybrid SACD released by Analogue Productions in 2014. Hybrid SACD is compatible with all CD players.